Here's what I did with the sweet peppers and jalapeno that came from my friend's garden before I put them in an omelette. It was mighty tasty, and mighty hot. The prep was simple. Put a pot of water on the stove to boil. Minced some garlic, chopped some onions, seeded and sliced the sweet peppers, and minced the jalapeno (left the seeds in. I always leave the seeds in. What's the point otherwise?). Heated some olive oil in a skillet. Added the onions and garlic, let it sweat. Added the jalapenos and let it sweat a little more. Added the sweet peppers, then salt and pepper to taste and cooked until everything was nice and translucent. Added about three-fourths of a cup of vegetable broth, brought it to a simmer, and then cooked 15-20 minutes to reduce. Cooked spaghetti two minutes less than package directed. Drained, then dumped in the skillet with the garlic, onions and peppers. Let cook two minutes more. Plated. 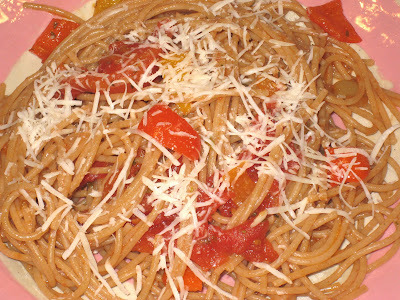 Topped with grated romano cheese. More diablo than Arrabiata, but you get the idea.